Black Ops is a standalone fan-made mod that ties all Rainbow Six titles that kinda use the same engine together. Instead of running Rogue Spear using RogueSpear.exe you can use the latest Black Ops engine to run the game so it works on modern day systems. 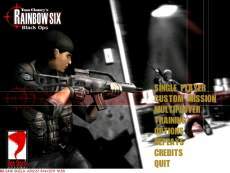 All seven Rainbow Six parts merged into one game: Tom Clancy's Rainbow Six (1998), Rainbow Six: Eagle Watch Expansion pack (1999), Rogue Spear (1999), Rogue Spear: Urban Operations (2000), Rainbow Six: Covert Ops Essentials (2000), Rogue Spear: Black Thorn (2001), Rainbow Six: TakeDown - Missions in Korea. Play Rogue Spear and other Rainbow Six parts with the latest 2.61 engine. It contains: all levels unlocked (Custom mission: Terrorist Hunt/Hostage Resue/etc), unlocked/modded access to all Lone Wolf Missions, modded/fixed Rainbow Six / Eagle Watch levels - very few glitches remain, Vista/7 audio fix, X64 Registry, Win7 Registry fix, remapped a load of the gamefiles to be able to work with Black Thorn, modded campaign - play 57 missions from Rainbow Six to Black Thorn, 53 Weapons in total to choose from, special unlocked terrorist weapons - Uzi, Dragunov, AK47, AK74, Skorpion; secondary weapons have been modded so the player can choose 2 primary weapons, default 6 grenades instead of 3, has its own registry paths - this version will not affect your current Rainbow Six installation, modded MP weapons so you can select all weapons as secondary. It's a small game, easy for LAN-gaming.